Shortly before Felix was born, in a fit of sheer optimism, I cast on a warm-weather blouse for myself. 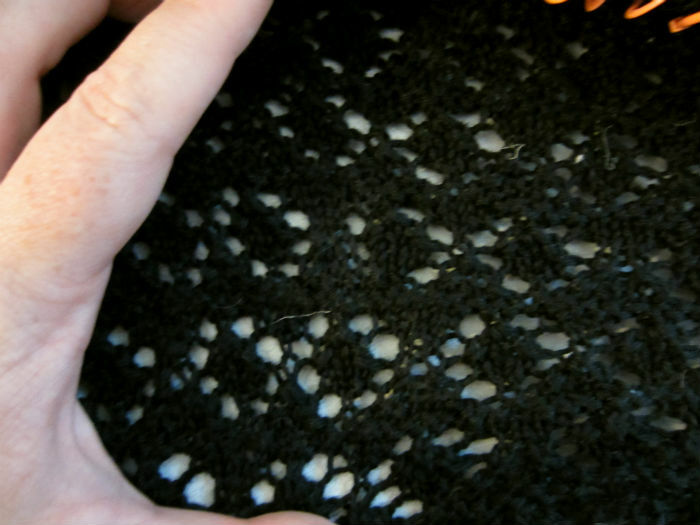 The idea was to knit the lacy yoke before the baby was born, so I could knit away on the solid stockinette body when I didn’t have a mind for anything else. I tried my best for a week to finish the yoke, but as the sweater grew, and so did my discomfort, I realized I wasn’t going to make it. The night before I went into labor, I broke down and cast on two pairs of socks, which has pretty much been what I have been knitting on since the baby came. A few days ago, I picked up my Thrysos again. I was only two pattern repeats away from finishing the yoke and casting off the sleeves. That glorious stockinette body was in sight! I set out to finish the yoke this past weekend…I don’t know what I was thinking, setting a goal like that when I know how big I am, which means the sweater must be at least equally as big–and out of sock yarn, that’s a lot of stitches–with an infant in the house, and a garden to tend, and a house to clean, and a seven year-old to love…so yes. I didn’t make it. While writing this, I only have four more rows before I cast off the sleeves, that’s 481 stitches four more times,(this is why round yoked summer tops are the best, the sleeves are done with the yoke!) and here’s what I’m dealing with. It’s kind of a bunchy mess. (Don’t mind the pictures, they were taken on a rainy day, with black yarn, in the early evening, and you can see all the cat hair from where my yellow cat slept on it. The fates were conspiring against me–and retaking them was apparently not something I was willing to put extra energy into, see previous paragraph for why.) 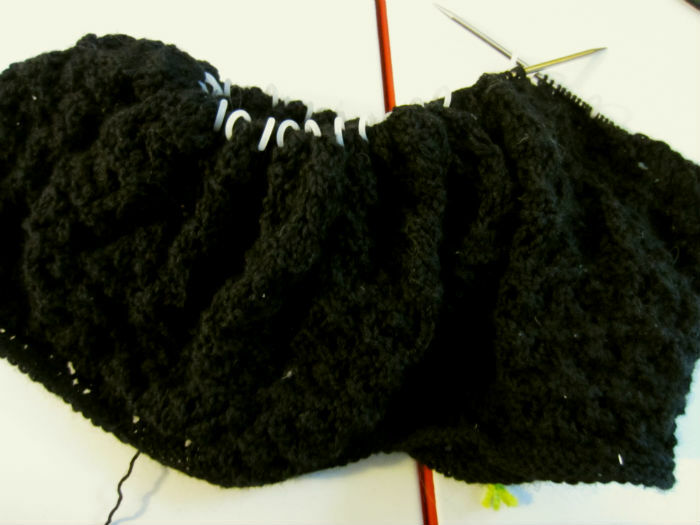 Granted, I am using my 24 inch needles and knitting a 40+ inch sweater, it is only natural that there is some bunchiness. I am finding the lace pattern super bunchy as well. I keep hoping that if I can just get through the sleeves, this thing will fly off the needles. It might be optimistic, but this whole project was conceived thus. I have to finish it by July 1st though, because I need these needles for my pogona. Very nice. I try to keep it up, but alas, I am failing miserably–and possibly being tempted by other projects.